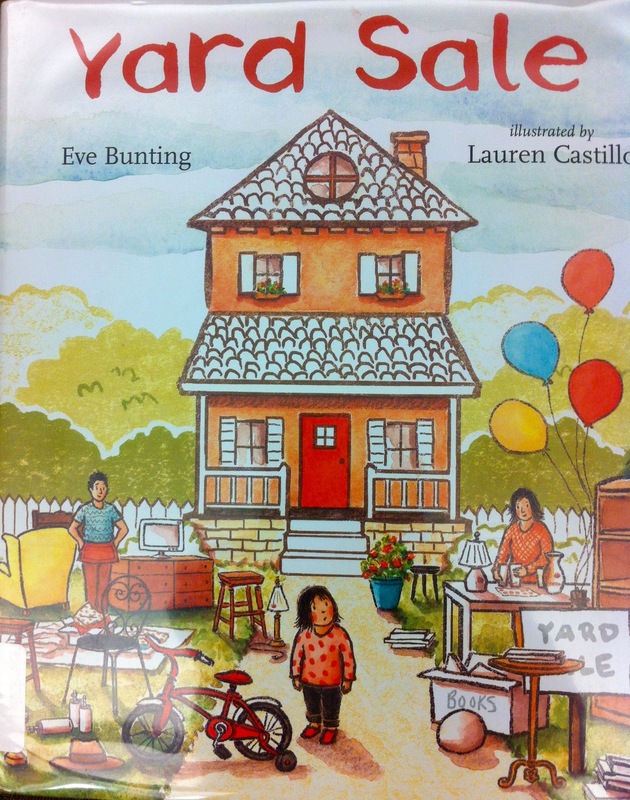 My PPBF choice for this week is the first book I’ve seen that features a child dealing with foreclosure. Opening: Almost everything we own is spread out in our front yard. It is all for sale. We are moving to a small apartment. Synopsis: (from WorldCat.org) Callie and her family are moving from their house to an apartment, so they’re having a yard sale. It can be hard to let things go, but in the end, it’s who you have – not what you have – that counts. There are many possibilities for Reader Response, either in discussion or journals – What makes a house a home? Would you rather sell something or give it away? Why? What is something that you have with “memory marks” like Callie’s headboard? What’s the hardest thing about moving? Schools or classes could create a “welcoming committee” for new students or brainstorm some ways to help others who are arriving or leaving. Why I like this book: Eve Bunting has written many books dealing with difficult issues in a very compassionate way. Her latest, Yard Sale, uses a gentle narrative that offers comfort to those children who have experienced foreclosure or displacement and understanding to those who haven’t. Moving is hard no matter what the circumstances. The additional dimension of giving up your possessions and comforts brings the reality of many children to the forefront. I’ve been waiting for this at my library. Sounds like a very good one. Thanks for sharing it and putting it back on my radar. thanks! I know what it’s like to move! This is a great book. Both the theme and the execution make it a truly “Perfect Picture Book.” Thanks. One of my favorites! Love Eve Bunting. oooh! can’t pass up a yard sale, even if it is a book! Interesting topic. I bet Eve Bunting does a great job! She’s amazing! One of my longtime favorites of hers is How Many Days to America. This one looks like a keeper! Will have to take a look. Thanks for highlighting!